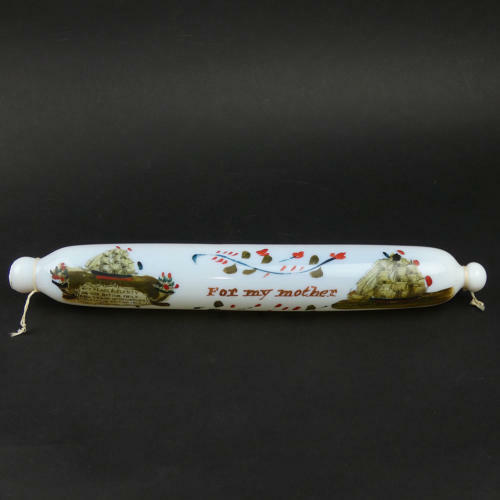 A Victorian, white glass rolling pin with a combination of transfer printed and hand painted decoration, dating from c.1860. These rolling pins were often made in the North East of England and the same transfers were used on them as were used on the Sunderland pottery. The transfers on this piece, which are also overpainted, show ships and the verse 'MAY PEACE & PLENTY ON OUR NATION SMILE AND TRADE WITH COMMERCE BLESS THE BRITISH ISLE'. Between the ship transfers are some very primitively painted flowers and leaves and the words 'For my mother' in gilt. The way that these items were made left them very prone to wear and often the prints and wording are now barely readable. This one, however, is in remarkably good condition. It has been a treasured gift and has probably never been used.